Do you wish you could have beautiful facial rejuvenation without a lengthy recovery? Now you can! At AesthetiCare, we offer a non-surgical facelift utilizing four different treatment modalities combined to give you a result very close to a surgical facelift without surgery. This means little or no downtime compared to surgery at ⅓ to ½ the cost of regular facelift surgery. PDO thread lifting combined with BOTOX® Cosmetic, fillers, and facial laser treatments give you near-surgical facelift results without the downtime and expense of going under the knife. Absorbable PDO threads provide natural and immediate improvement. The PDO thread lift is a non-invasive lunchtime treatment that delivers instant facelift effects, minimizing the appearance of loose and sagging skin without necessitating surgery. PDO threads are synthetic absorbable surgical sutures that have been used to perform cardiothoracic surgery, such as open heart surgery, for over 30 years and are composed of one of the safest materials for implantation. During a private consultation, your aesthetic provider will determine the best non-surgical facelift approach to achieve your cosmetic objectives. The PDO threads create a selective inflammatory response, just as other aesthetic approaches like fractional lasers, chemical peels, and microneedling do. Inserting the PDO threads triggers your body to heal itself by creating new collagen. During the four to six months needed to absorb the PDO thread completely, your skin also repairs itself around the threads, allowing the results to last as long as 12 to 18 months. A beautiful, youthful, and refreshed face has a V-shape. As men and women age, the breakdown of collagen and the effects of gravity diminish the structure of the V-shape, causing it to invert. The idea behind the PDO thread technique is to either create a scaffolding to support the tissues or to delicately lift the tissues and reposition the skin to recreate the V-shape that was lost over time. Although PDO threads can be inserted almost anywhere on the body, they are especially effective in the neck and jawline areas. The lower third of the face can be challenging to treat effectively with neuromodulators like BOTOX® Cosmetic or injectable fillers. PDO threads are an excellent treatment option to address the lower face and neck, while BOTOX® Cosmetic and fillers can address the upper and middle third of the face. Smooth threads are ideal for creating a mesh under the skin. This mesh serves as the foundation for the production of newer, healthier collagen. This technique tightens the skin naturally from within, and the results appear gradually, without causing a drastic change. Twist threads are similar to smooth threads in that they also trigger the body to produce new collagen. The twist threads add volume to an area and are often used to fill in nasolabial and marionette folds. They can also be used to plump the lips or replace lost volume in the tear trough region. Barbed threads are utilized to produce more of a dramatic, instantaneous effect. These PDO threads have minuscule barbs that grip the tissues underneath the surface of the skin. This grip allows your aesthetic provider to lift sagging skin with ease. Just like the smooth and twist threads, the skin will then start building new collagen, ultimately securing the results. BOTOX® Cosmetic targets signs of aging in the upper face by inhibiting the movement of the muscles that cause wrinkles. Crow’s feet, furrows between the brows, and horizontal forehead lines can be treated with this injectable neuromodulator. Maintenance treatments every four to six months may also be recommended to preserve your results. Patients can go home immediately following their non-surgical facelift. Side effects are usually minor and may include soreness, redness, bruising, or swelling. It should only take a few days for these to subside. It is recommended to avoid direct sunlight or use adequate sun protection, particularly during the initial stage of recovery. The cost of every non-surgical facelift varies depending on the number of areas to be treated, the desired extent of correction, and geographical location. While patients should consider the cost of a procedure when choosing a cosmetic provider, quality should never be sacrificed. Financing options are available for patients who qualify. Patients who undergo non-surgical facelift treatment may experience mild tenderness, bruising, and swelling in the treated areas. Over-the-counter pain medication can provide relief as these side effects resolve. What areas can be treated with the non-surgical facelift? Is anesthesia used during the non-surgical facelift? Local anesthesia is typically used during the non-surgical facelift to give patients the most comfortable treatment possible. When will I see the final results of my non-surgical facelift procedure? The PDO threads are inserted into the targeted tissue and are fully absorbed by the skin within four to six months. The body is prompted to produce new collagen in the treated area(s) for as long as 12 to 18 months, producing long-lasting results. Laser treatment results will be apparent four to 12 weeks after treatment, and the length of the results depends on the depth of the treatment. Injectable fillers and BOTOX® Cosmetic offer immediate results that last approximately six months to one year. 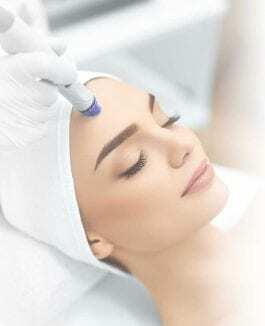 How long is non-surgical facelift treatment? The non-surgical facelift typically takes 30 minutes to complete. The length of the procedure may vary depending on your unique cosmetic goals and the desired extent of correction.